13 people are confirmed to have died after a van was driven into pedestrians in Las Ramblas. Around 100 people were injured, at least 15 of them seriously. Two men have been arrested – including Driss Oukabir, who was initially suspected of being the driver – but police have now said neither man was behind the wheel. They remain in custody. Police shot dead four suspects in the coastal town, around 120kms from Barcelona. A fifth, who was injured and arrested, has since died. Six bystanders were wounded, one critically and another seriously, in what authorities said was a possible terror attack. Reports suggested a vehicle was driven at pedestrians in an echo of the Barcelona attack, but this has not been confirmed. A police officer was also lightly injured in the counter-terror operation. The cause was initially thought to be a gas leak but police now say they are linking it to the attacks in Barcelona and Cambrils. 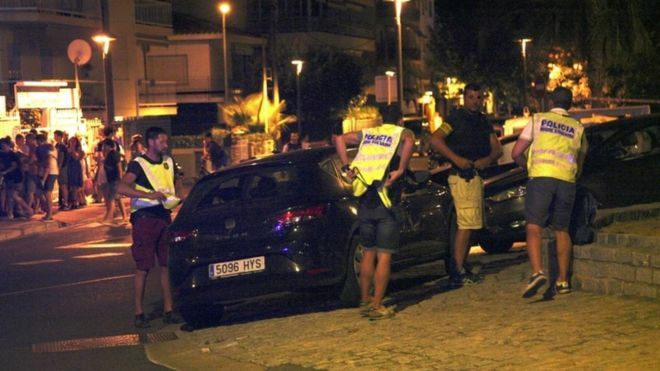 The health department has said that one of the six bystanders injured in Cambrils is in a critical condition. Spanish media including El País are reporting that a group of assailants in the town ran over several people in an echo of the day’s earlier attack in Barcelona. This has not been confirmed by authorities. However, police have said that six civilians and one police officer were injured.The Catalan regional government has now said that citizens from 24 countries were among the people killed and injured during the Barcelona van attack. That’s in addition to the four suspects shot dead and one arrested.